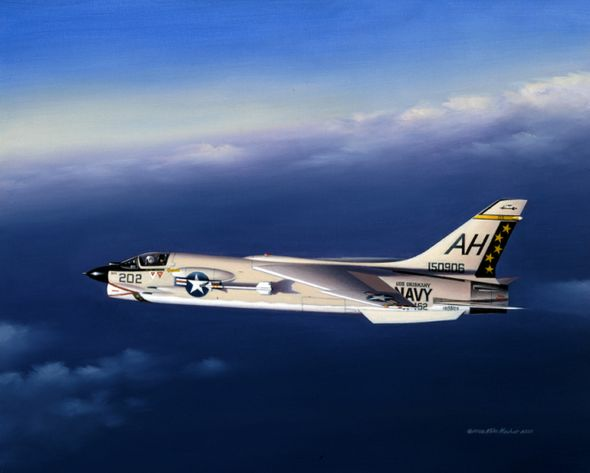 Mike Machat Hand Signed and Numbered Limited Edition Print: "Twilight-Gator"
About the Artist: Conceived as a carrier-based fleet defense fighter, the sleek and deadly F8U-1 Crusader became the U.S. Navy's first operational supersonic aircraft in 1957. Flown during the Vietnam War, the re-designated F-8 Crusader - affectionately nicknamed "Gator" by its pilots - soon earned the enviable reputation as being one of the most effective MiG killers of that conflict, having made the last aerial kill in naval aviation history to be accomplished using machine guns. As the saying went, "When you're out of F-8s, you're out of fighters!"